GRAPHENE can be used as “Stop Leak” in Spent Fuel Pool #4..
GRAPHENE has interesting anti-corrosion properties..
it can be used as an additive to water in boiler systems, the graphene flakes float in suspension and evenly coat the inside of the boiler system with a self-healing hi-strength boundary layer paint. GRAPHENE solution makes a good neutron moderator, and works well alloyed with borax. It helps to poison spontaneous fission of damaged fuel rods. GRAPHENE solution makes a good neutron detector, the electrical ohms detection between cathodic grid plates can provide vector imagery of micro-fissile targets in a cluttered pool. Alaska has a 280million ton GRAPHENE/graphite supply in a mining deposit available for use at Fukushima. This graphite mine can easily load the graphite ore onto tanker-barges as mining slurry in pipes running downhill from a convenient mountainside deposit. Located on a mountainside at Windy Cove, Imruk Basin. Intriguing! Thanks for such a “solution oriented” post. Agreed & think you’re on to something important. Don’t know much about how useful graphine would be (but thanks for the lead, I’ll go looking). But heavily borating the water in the SFPs would help keep spontaneous criticalities or possible sustained criticalities from happening during refueling. These are not explosions (there have been spontaneous criticalities at fuel fabricating and reprocessing plants, confined to the industrial equivalent of 55-gallon barrels). These have killed workers, but they are not nuclear explosions. More like Arnie’s “shine” phenomenon. Sustained criticalities (moderated fission chain reaction) would also emit deadly gamma “shine,” boil water like crazy, and maybe boil the pool dry faster than water can be replaced. Northern Hemisphere is where it goes, Plutonium and all. One speck of Plutonium kills. Question: What is the human disease progression from one speck of Pu ingested into the stomach, or trapped in a lung? Radiation Sickness leading to death. Plutonium injested in the body would be an extreme amount of radiation inside ones body. Look up radiation sickness on Wikipedia.org. It has a good overview. Actually, re-reading your question, I think you were asking for more medical specifics which I do not know the answer too. I think (from seeing some of your other posts) that you already know about Radiation Sickness. I was just replying promptly because I had not seen anyone else try to address your question. All Levels of Radiation Confirmed to Cause Cancer. Washington, DC July 30, 2005 The National Academies of Science released an over 700-page report yesterday on the risks from ionizing radiation. The BEIR VII or seventh Biological Effects of Ionizing Radiation report on “Health Risks from Exposure to Low Levels of Ionizing Radiation” reconfirmed the previous knowledge that there is no safe level of exposure to radiation—that even very low doses can cause cancer. Risks from low dose radiation are equal or greater than previously thought. The committee reviewed some additional ways that radiation causes damage to cells. There is no safe level or threshold of ionizing radiation exposure. Even exposure to background radiation causes some cancers. Additional exposures cause additional risks. Radiation causes other health effects such as heart disease and stroke, and further study is needed to predict the doses that result in these non-cancer health effects. It is possible that children born to parents that have been exposed to radiation could be affected by those exposures…. Many thanks to above responders. Calling Anne! All ENEnewsers know about the “1/50,000g ‘fatal dose’ for Plutonium” thing. But what I was wondering about is the actual disease progression somebody with a Pu speck in their lung or gut would experience on their way to death. What diseases and disorders could somebody with an internal Pu fatal dose expect to experience? Could they expect to survive 20 years, 15 years, 10 years, 5? Anne, do you have any of your magical links to share, perhaps research on Pu poisoning? then there’s the kids of those exposed. NASA has launched many plutonium into space (Mars rover curiosity 4,8Kg pu-238). If a rocket would explode in the atmosphere then many people would die. But NASA and governments do not care, all is save. NASA makes it way to Mars ASP so they can put the US flag in the ground and claim Mars theirs. Next mission: A planet on which one could live like planet Earth (unreachable for you and me, we remain on Earth the U/Pu/Am..factory). A U.S. Transit-5BN-3 nuclear-powered navigational satellite failed to reach orbital velocity and began falling back down at 150,000 feet (46 km) above the Indian Ocean. The satellite’s SNAP-9a generator contained 17 kCi (630 TBq) of 238Pu (2.1 pounds), which at least partially burned upon reentry. Increased levels of 238Pu were first documented in the stratosphere four months later. Indeed NASA (in the 1995 Cassini FEIS) indicated that the SNAP-9a plutonium release was nearly double the 9000Ci added by all the atmospheric weapons tests to that date. The United States Atomic Energy Commission reported a resulting threefold increase in global 238Pu fallout. All subsequent Transit satellites were fitted with solar panels; RTG’s were designed to remain contained during re-entry. This is because of radiation generated by plutonium. No way in hell will the 2020 Olympics be held in Tokyo. The city will be in shambles by then, over this country and possible humanity killing insane demonic technology. Gundersen keeps saying how TEPCO has been trying to fight Fukushima “on a budget” instead of throwing the kinds of resources at it that it truly requires. When you consider how much it would cost the Japanese government to host an Olympics, that money could be put to much better use if THEY would deal with Fukushima in the aggressive way that TEPCO is failing to do. It’s an incomprehensibly short-sighted and misguided use of resources (another symptom of the denial–I fear terminal denial–that is plaguing too many in that nation and beyond). When I connect the dots and project the lineage of the government officials’ actions into the future I read their attitude as this: If the economy collapses because the money invested only saves lives instead of generating profits for certain groups of investors, that new lower grittier lifestyle isn’t really worth living. We’re trying to keep the global economy, in it’s present hierarchy, together. That is all that matters. All spent fuel assemblies have been corroded by seawater, and compromized by explosions, nuclear fires, dewatering of the pools, and falling debris. Removal of this fuel is going to prove to be highly problematic. Having some of the spent fuel assemblies break apart during handling is a certainty. (I hope the new #4 crane is remotely controlled). Perhaps most of the spent fuel assemblies can go right into dry cask storage. At Fukushima, TEPCO has been placing radioactive items (fuel cells/rods?) via crane in long tube like casks, placed for holding into water filled freight sized containers by the port, then placing on a barge for ‘disposal’ or dumping somewhere. Photos from some ENEWERS show these images clearly. Any have idea where the ‘tubes’ or casks went to? From barge to ??? Were they dumped into the ocean..?? I remember your posts on this recently. feliks recently posted a link to vids showing dockside work. They showed those tubes. They are part of what is being used for the seaside wall. Good close-up vids. I’ll try and find link. “The process will begin in November and Tepco expects to take about a year removing the assemblies, spokesman Yoshikazu Nagai told Reuters by e-mail. It’s just one installment in the decommissioning process for the plant forecast to take about 40 years and cost $11 billion. JB, also adding to the suspense, this has never been attempted without computer assistance. All computers are off-line damaged- and cannot be replaced at Fuku Daiichi. Has to be done by humans…dressed in protective gear with limited vision, sense of touch etc. I mean, picture it… they will need a heavy crane(s) and other equipment to get the rods right….. HOW is it that possible if the ground is already soggy , unstable and sinking etc? God I hope it DOES work. I guess it demands Die Trying. oh yeah ? Thanks for noticing after 2.5 years, new york times. 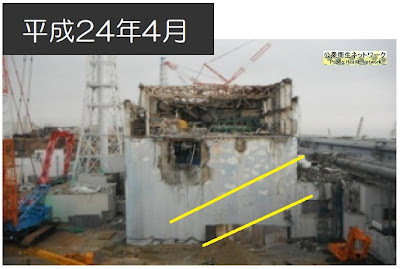 I encourage the international community to question the condition of 4..
TEPCO needs to admit what went so wrong it needed to be photo shopped. Questions need to be asked..such as how the crack occurred at the base of the reactor. Seems to me the only way that this could happen… is if the top of the building separated from the foundation..I assume during the fire/explosion. This is an older clip.. This was an active time period. Visuals..should assist in assessing the conditions of the reactors..including reactor 4. Dear @heart and @nuckelchen, all of the videos and stills collected since 3/11 show the disaster in all its “glory;” the hidden story which has been covered up by TEPCO and government. Yes, yes, I know we all say that, but the reason all our videos and photos get deleted –our timeline evidence destroyed, is the truth they show. Since we know the WORST of the video/photos were edited out, or could have been, we may only have the tip of the iceberg. Like the one that sank the Titantic–only this time its our lives on the vessel earth. Good job of videocording, Nuckelchen! Now we can look forward for the video expose/e-book..with all the evidence!! Will be a ‘who dun it’ non-fiction best seller! Bet TEPCO would PAY to keep you from writing this, Nuckelchen..want some help? I volunteer….e-publishing is so easy. Due to issues with ‘tepco rights’ to the webcam, just e-publish as on wikileaks…. They are not trying to remove “spent fuel” from # 4 fuel pool. we were allowed to see another rack. This rack contained different rod assemblies. Very different. They were many suspect, pure Pu rods. Yep, they were breeding in #4. So they must remove that special fuel rack. So its not to save our asses, its to cover theirs. Must not let the world know that Fuku was a weapons lab.. Certainly looks that way, pictures from a 2011 article. The article is mainly a debunking of H explosions of the reactor buildings, maybe the site was enriching, maybe not. Either way, the cover story stinks. “…I finally have a coherent picture. 2.5 years of obstruction by nuclear industry aimed at preventing people from having any coherent picture of the sequence of decisions which resulted in this nuclear disaster. 1. They lowered the Fukushima coast by 10 metres to make it cheaper to pump cooling water to the proposed power plant. 2. They built the power plant over an aquifer and on ground with a fault line present 3. They built the basements below sea level. 4. The quake diverted the underground river of the aquifer through the basements 5. Being below sea level the emergency generators and switchgear were doomed to be flooded. 6. cooling failed, the reactors melted down, the 70 holes in each reactor bottom (design of control rod entry) meant fuel and water leaked from bottom of reactors. 7. TEPCO decision to put emergency generators and switchgear in basements. to save money in 1966. 8. 400 tons of water must be poured into reactors per day to keep them cool. 9. this water enters the underground river and flows to the sea. 10. fuel is too radioactive to approach and remove and will remain so for years. 11. the flow of radioactive water to the sea will continue. I concur and would only add 17) Have current “Superpower” nations direct attention away from the real catastrophe of FK and onto any other topic; Syria, economies, twerking ad nauseam. Max Keiser has an article showing Syria is about pipe lines and russia, i.e. money and power. Ellen Brown has an article showing that the banking cartel is invading the middle east because muslim state owned banks dont permit usury. Right or wrong, the powerful elite live in a psychopathic world of greed unmindful of human suffering. They dont care about a signed petition to stop their insane criminal behavior. This is the real reason nations dont step it; they are ruled by corruption and psychopathy. One thing you can be sure of, the DOE knows a lot more about this than we do. W8R, not really. Its well documented that #4 spent fuel pool is in bad shape. You may be right but the bigger issue is trying to avoid a spent fuel fire. Tepco has been motivated to lie for many reasons. The bankers who lend them money, politicians, corrupt nuclear industry, USA and others strategic interests etc etc. Its no secret now that Tepco has been running the show like a cheap penny pinching Scrooge. Japan and the International community have been hoping it would go away and it hasn’t. They have been slow too. So funny Obummer is trying to invade Syria with his War on Terrorism as Japan poisons the Pacific. Here at Enenews we are waging a war against Stupidity. Eco-terrorism if you threaten a food source like the Pacific. Perhaps the greatest ever crime against humanity and the world. I would like drone attacks on Tepco management and troops on the ground in Japan. NZ is lovely this time of year, and most other times as well. mopar69…thanks for the tip..also thinking about uruguay…. Sounds excellent, perhaps a base from which to reset the current modi operandi? Probably about the time Comet C/2012 S1 Ison will perihelion so if they screw up they can blame the disaster on the comet. Odd coincidence eh? If not that, they can blame the Sun’s pole flip, which also happens around the same time. Mopar69- keep your eyes on the sat maps in the PNW by Canada/Alaska, there has been a counter clockwise gyre in the upper atmosphere for a couple of weeks. It is not only the sun that is changing. Will do, thank you for the information. Not to be a Negative Nancy but I’m going to just say it. Actually I’ve been saying it for a long time, it is too late to run anywhere. I’m not pulling that out of the sky, it is simple science in my mind. It was in North America within a week and starting to accumulate in its band of air and water and even lands within the first month. 24-7-365 it has continuously spewed in an ideal fashion… it steams and just naturally forms in the cloud systems on the jet stream. I’m surprised we haven’t seen more illnesses here but you never know, it too may have been suppressed and misdirected. It is a one way street, life-wise. No one wants to say it, but Japan is an ex-nation. It is part of a history book. It no longer exists. Any Japanese who can, would be wise to leave. I think the reason the truth about the severity of Fukushima is starting to be told in the MSM is because all the players divested themselves of stocks etc. and now they can let Japan free-fall like like the twin towers and building 7 on 9/11. For all we know they may well have started to remove spent fuel, tepco stated earlier that they would not inform us when fuel was to be removed from pool, you don’t want terrorist to know when you are in a very precarious position or some lunatic. Or to let everyone a killing machine carried on a cloud across the Pacific is coming lest the peasants seek to retreat. quick, calling all peasants…retreat, retreat! I’ve been following this circus for over 2-1/2 years. This is the crisis that population reductionists have been asking Satan for! Billions of lives affected and shortened. 100s of Millions will die within 5 years of exposure. Trillions of dollars made by building these plants. Billions of dollars wasted in cleaning up the poop from them. Within 10 years 2.5 Billion people will die. Within 20 years 2.5 more Billion will die. Within 30 years 2.8 more Billion will die. That will leave about 1.5 Billion left….just as they wanted. Why do you think Japan has dragged their feet? Why do you think RADIATION monitoring stations in the US were trucked away in mass? Why do you think TEPCO has been lying about EVERY DETAIL of this crisis from it’s start? All part of a well executed plan. Yes, and while everyone was busy watching the latest housewives series on Bravo, and voting for American Idol, the poison came pouring out of the damaged reactors. what was the american idol count? my I ask for the source of your figures? I think that people who are against nuclear should begin a campaign to state all the other health effects of radiation as well as cancer. There are many other health effects that can kill or reduce quality of life. In this generation and the next. People only think about cancer and it can be pushed to the back of their minds because it may not happen for 20 years. All the nuclear industry has to say is nobody has died because of Fukushima and ignore all other health effects as well as the loss of jobs, homes and land,pets and other animals as if this is of no consequence. As if the quality of life isn’t important. All the health consequences should be named every time anyone talks about cancer. I doubt many people even know what they are because only cancer is mentioned and then minimized. The only reason the government is now making noises about taking over and doing the job right is because they want to have the Olympics and make lots of money off of it. With the length of the half-lives this event marks another facet of the genocide project to limit the full potential of humanity; the culling/death/disease wave will have a multi-generational effect that does not sort out of who to take and who to allow to stay. I fear something is happening underground. Carrots is a separate topic. ENENews receives no funding from anyone or anything, except 1) People who donate via the button below, and 2) Google, who pays for the two ad spots. Thanks to all who have donated or are planning on doing so, it’s nice to know people appreciate your work.